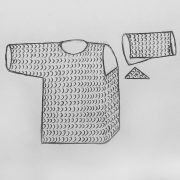 Iron is the top choice for historic mail. It is rather soft and therefore good for riveted rings. Look for pure annealed iron. It usually costs less than 2$ per kg. It is not a problem if it is a bit rusty. Steel is iron with some carbon content and other elements. It is hard and therefore good for butted rings. Look for spring steel or stainless steel. 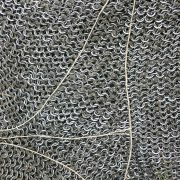 Note that historic chainmail was not made of steel but of iron. Titanium is the choice for ultra lightweight rings. It was not available during the middle ages. 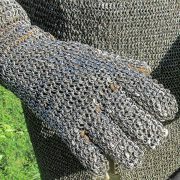 Yet it can be used to make riveted rings, that look a bit historic. Thus it is popular among European martial artists. Unfortunately, it is rather expensive. It also gets very brittle when it is deformed. This makes it difficult to work with. Aluminium is almost as lightweight as titanium but much cheaper. It was not available during the middle ages. It also gets brittle when it is deformed. Copper is very soft and easily available. You can use copper wire from electric cables to practise making riveting rings. In history, copper-alloys have been preferred for better protection of corrosion. Copper-alloy is a mixture of copper and other metals. For example, Brass is a mixture of copper and zinc. Bronze is a mixture of copper and tin. The two are very similar and there are mixtures containing copper, zinc and tin. Therefore copper-alloy is a better term. 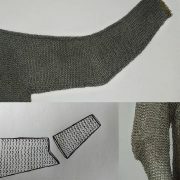 Copper-alloys have been used for decoration in historic mail armour. For corrosion: Iron and steel can be coated with a layer of nickel or zinc to prevent corrosion. That layer can be removed by acid or heat. 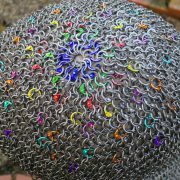 When chainmail is used, rings rub on each other. That way they naturally remove rust. 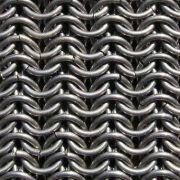 Thus even chainmail made of iron rings does not need corrosion protection if it is used regularly. It should be stored dry. Sweat needs to be washed off. It helps to cover the rings in a bit of oil. For colour: Aluminium, Titanium and Niobium naturally form oxidation-layers on their surface. These layers stay on the ring and prevent the inside from rusting. It is possible to artificially make those layers bigger. That makes the rings colourful. Look for anodized rings. Rings can also be painted. Yet anodized coating is more durable. It is good for tightly closed rings to be made of a soft metal. That includes riveted, welded and solid rings. Soft metal allows the rings to deform when hit. Deforming consumes the energy of the impact. It also helps to spread the force on many rings. Butted rings, however, need to be made of hard metal. Hard metal prevents the ring from opening. In butted chainmail, this is more important. Yet hard metal that is generally brittle. It is less able to take up energy by deforming. As a result, rings break and spread less force on their neighbours. 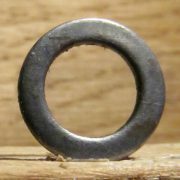 The ring’s size is described by their inner diameter. 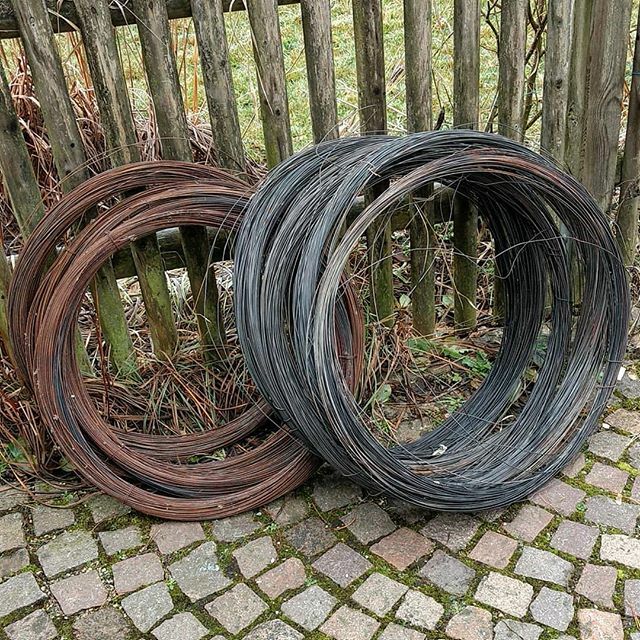 I recommend the wire to be 1/6 or 1/7 of the rings inner diameter. 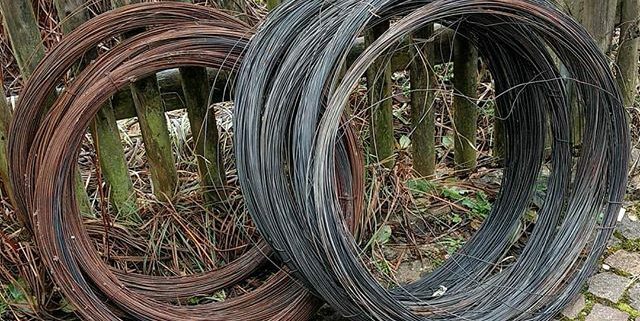 The wire is usually offered in sizes of 1.0mm, 1.2mm and 1.4mm. With 1.0mm wire you can build 6mm or 7mm rings. With 1.2mm wire you can build 8mm and 9mm rings. And with 1.4mm wire you can build 10mm and 11mm rings.